Last month I wrote about learning to draw using Betty Edwards’ book on the subject. This post is about what I’ve done since I worked my way through that book. It’s a bit lonely working away on your own, and my next move was to try to find a class. Blackburn College, not far from here, had at the time a good range of part-time courses (these days there’s not so much available). I started on a life-drawing course; three hours every Thursday evening of drawing and sometimes painting from a real live model. It was fabulous. I did the same course two or three times, interspersed with something called ‘Open College of the North West’ which is a kind of A Level equivalent, but for adults, and then moved on to City & Guilds Level 2 painting. The formal titles of the courses didn’t matter too much to me; I went for the experience and the outstanding tuition. Blackburn College is an old-fashioned place, and I mean this in a very good way, in that it never abandoned life drawing, even when almost every other college ditched it. So they have a long tradition of teaching drawing. The tutors are excellent: take a bow, Mark Edmundson and Richard Cross. I learned lots from them both. 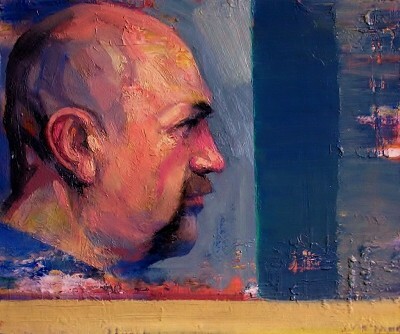 The painting below is one of Richard’s. My other main experience of going on courses has been taking life-drawing classes in London with Rachel Clark. She is another brilliant teacher: critical, encouraging, rigorous and dedicated. She has been running courses for many long years, and I went to several. I’ve not been for a while, although Rachel assiduously keeps me up to date with the details. The courses are relatively expensive (although definitely worth it) but the problem if you live outside London is that you have to add in the cost of staying in London for up to four days, plus the cost of travel, in my case from the North-West of England to London. (Note to readers outside the UK who haven’t visited: the inter-city train fares here are larcenous). So it all adds up. The other thing I’ve done that everyone should do, if they want to draw and improve their drawing, is to, well, just draw. But I know that I haven’t done enough of it. Life and, especially, work just keep getting in the way. A daily commitment to drawing would be the way forward, if I could just bump it up my list of priorities. Ah, well, tomorrow is another day. On my ‘about me’ page on this website I list four things I’m interested in, one of which is learning to draw. I’ve not said anything so far in this blog on the subject so I thought perhaps it was time I did. I was keen on drawing at school but not very good at it, and there was never the slightest indication that it was possible to learn to draw. The art teacher certainly never attempted to teach us how to draw, and I wonder now whether she could draw herself. 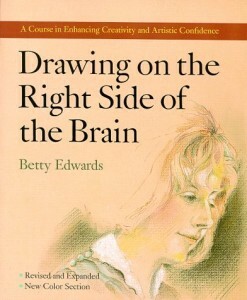 Many years later I cottoned on to the existence of a book about drawing that took a radical approach: Betty Edwards’ ‘Drawing on the Right Side of the Brain’ . The book was first published in 1979, but has been updated since and I see that the 4th edition has been published recently. Betty Edwards’ view of drawing is that it is a ‘teachable, learnable skill’, which is excellent news for anyone who may have felt that it was a natural ability that you’re either born with.. or not. The book includes a lot about research on the workings of the brain (hence the title), but more significantly for anyone who wants to learn to draw it contains what is effectively a course in learning to see and to draw. There are plenty of accolades around for this book (have a look at the relevant pages on Amazon for some rave reviews), and I’m happy to confirm that it really is effective. I conscientiously worked my way through the book and by the end of it I could draw pretty much anything more or less accurately. Of course, I can’t draw like Picasso or David Hockney, and learning to draw doesn’t make you an artist (as Betty Edwards points out). However, learning to see is a pretty important skill in the visual arts, so this book could just help to set people on the road to becoming an artist. I’ll write another post sometime about drawing and what I’ve done since I finished working through the Betty Edwards book.